Festivus is a secular holiday celebrated on December 23 and is designed to replace the celebrations of Christmas and Hanukkah traditional put people in stress and involve many financial expenditure. The holiday was invented by Dan O'Keefe in 1966, and no one heard from him until 1997, when his son Daniel O'Keefe, editor and writer of the program Seinfeld, incorporated into series. Frank Costanza , George Costanza's father celebrates the feast he invented to protest against the commercialism of Christmas Eve. 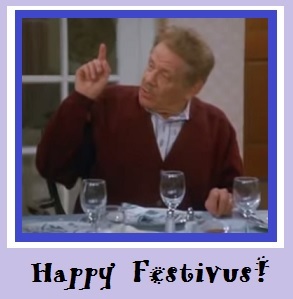 Festivus holiday is actually a result of the Seinfeld parody adopted by fans of the series and people trading opponents made holidays worldwide. US hold parties in honor Festivus and websites through which you could send holiday cards. There are even websites that sell Festivus rods. Festivus customary practicess: big dinner, placing aluminum pole instead of a tree, holding a ritual "cycle of complaints" and "show power by "primary blame someone who is both disappointing and having a wrestling match. Another custom of the feast is tagging events that happened as a "miracle". Holiday ends as head of the family falls on the floor and could not get up during a wrestling match. Blessing Festivus holiday is "Festivus for All" and the chapter ends with these words of the show.